With all client projects the design process is very much a creative collaboration to which, from the beginning to the end, you contribute your own ideas and tastes. Exquisite fit is the essence of the traditional tailors craft and is of paramount importance. To achieve this I hand cut a tailor made pattern specific to your unique body shape. Subsequent fittings ensure the most fabulous and perfect fit. All women are sensitive about the way they look and at all times I will treat you with courtesy, dignity and respect you deserve. I can give advice on gorgeous colour palettes, texture and fabric choices as well as help you explore new shades or make the best use of your favorite colours. The fabrics I use tend toward natural fibers wherever possible but these will be tailored to suit your budget. Bespoke can be surprisingly affordable and saves money in the long run. 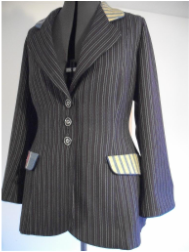 High quality finish is extremely important to me as well as you, as a specialist women’s tailor I take especial care to finish all projects to the absolute highest quality. The style and design of bespoke garments can be as distinctive or as subtle as the client desires. This is the essence of the craftsmanship of true British bespoke tailoring.